I have updated this article on 12/9/2014, at the bottom of the existing article. Click here to skip to the update. Oh, come on, Daily Targum. I thought I was done with you. I thought when you finally got rid of Amani Al-Khatahtbeh (she also goes by Amani Alkhat), we wouldn’t have to deal with you assigning opinions to your readers. Well, it turns out that the new Targum Opinions Editor, Sabah Abbasi, is just as bad. Her Facebook likes include…Amani Alkhat, the Palestinian Children’s Relief Fund, the Princeton Committee on Palestine, MuslimGirl Rutgers (an organization that Amani founded), Rutgers Divest, and Rutgers NB Students for Justice in Palestine. Obviously, anyone can have whatever political opinions they want, I’m not advocating for any kind of censorship. It’s just that, given the history of the Daily Targum’s Opinions Editors, I’m very skeptical about the student employees’ abilities to keep things unbiased when it comes to Israel. Below is the article which Aaron London submitted in response to the image of him being given the middle finger above – parts of his submission that were removed have strikethroughs, and parts that were added are in red. My name is Aaron London and I am the student featured in the original photo from the SJP “Die-In” rally three weeks ago, where an SJP activist is seen giving the middle finger to my face. I have watched for the past three weeks how every writer on behalf of SJP has manipulated the word “Zionist” or “Zionism” – a word used no less than 13 times in their articles- to negatively categorize anyone Jewish and pro-Israel, or anyone who argues a point of view different from their own. Zionism is not a curse word- it is the belief in a homeland for the Jewish people. As a student at Rutgers for the past four years, I have witnessed how members of SJP have functioned not only on our campus, but across the nation to condemn Israel and paint it as the fundamental problem in the Middle East while never once – I’ll repeat, never once- discussing the terrorist Palestinian elected ruling government in Gaza- Hamas. while never once discussing the harmful actions of the ruling government in Gaza: Hamas. In the language of many SJP members I have seen and heard from, the message is clear- Zionism is the essential equivalency to terrorism. It’s ironic that SJP will accuse “Zionists” of disseminating lies and propaganda, while their entire rhetoric refuses to acknowledge the whole picture. But why should we be surprised? SJP employed the technique that every hate group employs when confronted by those who disagree with them – demonization of “the other”. I belong to a Jewish fraternity, therefore since my fraternity is Jewish, we must all clearly be Zionists, therefore we are a Zionist ‘entity’ or a ‘counterpart’ – not individuals. How could it be that for a group that cares so deeply about Palestinian rights, not a word was spoken about when Egypt bulldozed close to 1,OOO Palestinian homes in Gaza to create a kilometer-wide buffer zone to combat the terror-tunnel smuggling of Hamas? Thousands of Palestinians are now homeless due to Egypt, but there have been no demonstrations, no eviction notice propaganda stunts like we saw last year when Israel was accused of doing the same thing. Palestinians are suffering human rights abuses and the lips on the SJP machine remain closed. 1.5 million Palestinian Arabs are under the rule of a recognized terrorist organization, Hamas , which some countries label as a terrorist organization, and they haven’t had elections since the mid-2000s, catapulting the Palestinians further into dictatorship. Palestinians are suffering, but when it comes to standing up against Hamas, SJP is silent. And where was SJP when two Palestinians entered a synagogue in Jerusalem and butchered the Jewish prayer-goers with axes, a meat cleaver, and a pistol, killing five (three of them American rabbis) and wounding twice that, and when Hamas and tens of thousands of Palestinians in Gaza celebrated the attack by passing out sweets and praising and memorializing the acts of these two Palestinian terrorists? Needless to say, they were silent and will no doubt either blame Israel for the attack or accuse those who report these facts as also spreading ‘propaganda,’ never addressing the culture of hate and murder that Hamas and the Palestinian Authority sow in their people. The following four paragraphs were removed in their entirety, and constitute the main point of the article. I am a Zionist. And I’m damned proud to be one. But just because my fraternity is Jewish doesn’t make it Zionist, and doesn’t make it ‘the enemy’ and shame on the SJP for trying to sow a culture of hate on our campus whereby anyone who supports the state of Israel should be viewed as evil. The picture from the “Die-in” was in fact a perfect, unbiased account of what really went down. It displays SJP for what it truly is – a national campus hate group devoted to the destruction of Israel and all who support her. In the face of such vile hatred and lies, when SJP students were chanting, “From the River to the Sea, Palestine will be free,” a chant that calls for the utter destruction of the land between the Mediterranean Sea and the Jordan River, the land that has historically been the home for the Jewish people, the single best response I could come up with on the spot was to celebrate Israel’s existence as a beacon of democracy in the Middle East and the world– much more so than the likes of any Palestinian leadership. I mourn the loss of life and yes celebrating life when others who profess a wish to destroy you pretend to be corpses looks bad on camera, but probably not much worse than using dead children who were tragically killed while Israel was defending itself as cheap propaganda to sell half-truths and an ideology of hate. When SJP and its supporters can talk any narrative other than the destruction of Israel perhaps then we’ll see a long and lasting peace. Until then, I won’t hold my breath. Let’s start from the top. 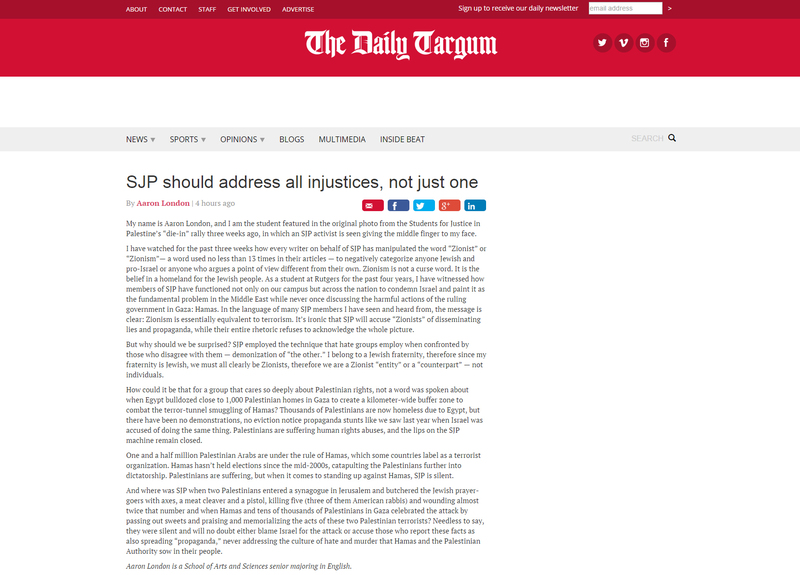 First, the title that the article was assigned – “​SJP should address all injustices, not just one” – that’s not the point of Aaron’s piece at all! Sabah Abbasi has attempted to paint Israel as one of the “injustices” – when, in fact, Aaron’s article expertly points out that the Students for Justice in Palestine are “disseminating lies and propaganda” regarding Israel. At no point did Aaron concede that Israel was, in fact, the one injustice that SJP are currently focused on. Instead, he states clearly and without equivocation that the worst thing to happen to the Palestinians is their elected governing body, Hamas. Are we to assume that the Opinions Editor, Sabah Abbasi, lacks some critical reading skills that are crucial to her job? Or, should we assume something more sinister – that she, like her predecessor, simply cannot remain impartial? Next, Sabah Abbasi “corrects” a sentence calling out Hamas as being a terrorist organization, and replaces “terrorist” with “harmful”. Having the flu is “harmful”, Sabah. Hamas is a terrorist organization, according to the United States of America. Hell, even the Jordanians hate Hamas. It seems the only ones who think Hamas is not a terrorist organization is the Daily Targum staff. The Daily Targum also changes a reference from “a recognized terrorist organization” to “which some countries label as a terrorist organization”. I’m sorry, which countries of particular import don’t think Hamas is a terrorist organization? And now for the good part. Four paragraphs were chopped off the end – paragraphs which began with “I am a Zionist. And I’m damned proud to be one.” The entire point of the article was contained in these last four paragraphs – the fact that being a Zionist does not make you “the enemy”, the fact that the published “Die-In” picture was an unbiased account of the rally, and most importantly, the fact that the Rutgers chapter of the Students for Justice in Palestine lead a genocidal chant about the total destruction of Israel. “From the River to the Sea, Palestine will be free” calls for a one-state solution for the land between the Mediterranean Sea and the Jordan River – which, of course, is Israel. They don’t want a two-state solution, they don’t want to discuss peace, they don’t even want to allow a Jew the ability to have his opinion published without being radically changed to match their agenda. I’ve come to expect nothing less from the Daily Targum. This is such a clear example of using your position of power to hide views that don’t agree with your own – classic bullying. This correction references the article by its published name (which is fine), but makes no reference to the fact that the title was actually changed on the website (the change is, of course, a good thing, but by not pointing it out, a reader looking for the update might search for the now twice-published title, and would find nothing). 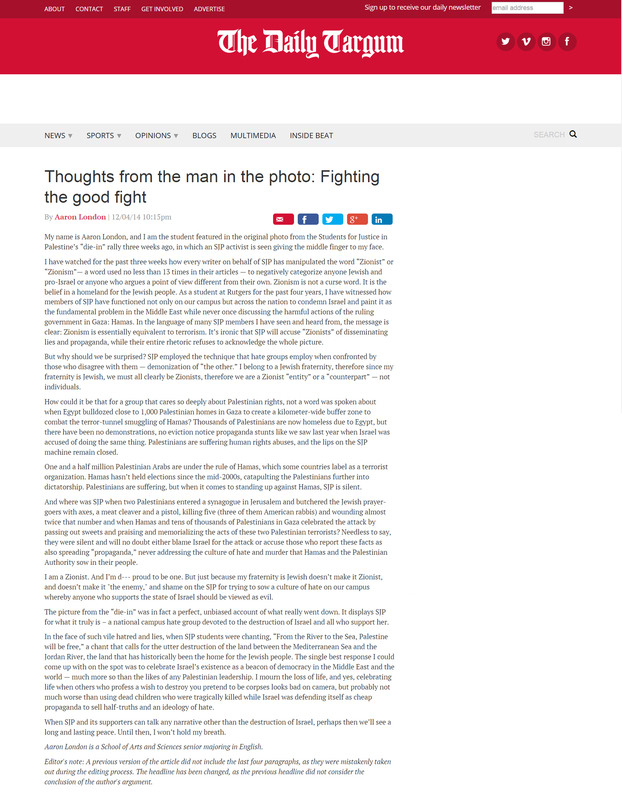 The title of the piece was changed to “Thoughts from the man in the photo: Fighting the good fight”, a much more apt title. The URL was changed as well, rendering the previous URL unusable for websites that referenced it. The online version of the article contains the following correction: “Editor’s note: A previous version of the article did not include the last four paragraphs, as they were mistakenly taken out during the editing process. The headline has been changed, as the previous headline did not consider the conclusion of the author’s argument.” This correction does reference the changed headline, although if you’re reading that correction, you’ve already found the new headline. I was contacted by the editor-in-chief, Alexandra Meier, who wanted to make two points clear: one, the deletion of the last four paragraphs were a technical mistake, not a purposeful edit. Two, she was apparently the one to make the edits, not Sabah Abbasi, the Opinions Editor. I’ve chosen to keep the name and political affiliation of the Opinions Editor within my article, because I believe that the Opinions Editor is responsible for what is published in the Opinions section of the newspaper and website. I’d like to give them the benefit of the doubt as far as the edits, but they’re still quite troublesome to me (namely, the removal of the “terrorism” references – whether or not the Opinions Editor or Editor-in-Chief agree with that label, it is Aaron’s opinion that the label fits, and it’s Aaron’s opinion that they’re publishing). I’d also like to give them the benefit of the doubt that they just skipped four paragraphs because of a “technical error”. Perhaps I’m too jaded by past experiences with the Targum – I therefore leave it up to the reader to make the determination of what happened with the publishing of the opinion. We’ll be keeping a close eye on future opinion pieces, and I suggest the Targum editors do the same. Normally I’d think deleting half an article is a technical glitch that should result in the firing of several people, but at the Daily Sudoku it makes sense that this was a total accident by incompetent staff.